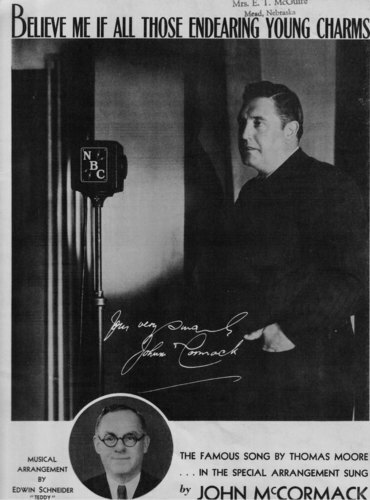 Still considered to be the standard by which all Irish (Celtic) tenors are measured, John McCormack had a long and much-honored career on the recital stage, the opera house and radio. His Victor and HMV records sold in the hundreds of thousands, and he even found his way into two films . Born in 1884 to Scottish parents in the mill town of Athlone, Ireland, young John showed an early interest in music. When he fetched the coveted Irish singing prize in 1903, he knew where his future was to be. After studies in Italy he first sang in opera in 1906. In 1907 he became the youngest leading tenor at London's Royal Opera at Covent Garden, singing with the likes of Melba, Tetrazzini and others. He later ventured to America where he sang with the Hammerstein Manhattan Opera in 1909 and then sang periodically with the Metropolitan Opera, from 1910-18. By 1912 he had become a major name on the recital stage, which was to be his natural habitat for the next 25 years. He sang all over the world, in large cities and small towns, and his Victor records only enhanced his fame. He numbered the most-famous musicians of his day as his friends and was known in many society and artistic circles as a jovial racounteur and loyal friend. The Vatican honored him with a peerage and title of Papal Count in 1928; Holy Cross gave him an honorary doctorate in 1917; the French government gave him the Legion of Honor in 1924 and Notre Dame honored him in 1933. Hollywood beckoned and he made a sound film entitled Song o' My Heart in 1929/30. He retired from the opera stage in 1923 and the recital stage in 1938. For many years he maintained homes in the USA and Ireland, notably Moore Abbey. John "Count" McCormack died in September, 1945, in Ireland, of respiratory problems. McCormack's records have something for almost everyone who loves great lyric tenor singing. A master of song, he sang in English, Italian, French, German and Latin and recorded Schubert, Schumann, Wolf, Franck, Faure and English composers such as Vaughan-Williams, Parry, Coates, Elgar and Finzi. Early in his career he made some definitive 78 records of classic arias, notably from Don Giovanni, Daughter of the Regiment, The Pearl Fishers, La Traviata and La Boheme. Popular songs of the day were no stranger to him if they suited his voice and many copies of Three O'Clock in the Morning, Just a Cottage Small and Keep the Home Fires Burning made their way around the globe. Songs of sentiment like Love's Old Sweet Song, Ben Bolt and Stephan Foster melodies were a part of his recorded and stage repertoire and music of a sacred nature appealed to his devout Irish Catholic faith. Panis angelicus was especially connected with him. He sang it with a choir of five-hundred at the 1932 Dublin Ecumenical Congress final Mass in Phoenix Park and it was broadcast all over Ireland and England/Scotland. Many listeners today know him only from his many records of Irish songs, notably Molly Bawn, The Wearing of the Green, The Rose of Tralee and Mother Machree. He recorded dozens of them, some several times in both acoustical and electrical editions.Those wishing to hear him will have no trouble as many CDs exist on different labels showing all aspects of his vocal artistry. The contents of this page, all copy and visual images, are the property of Malley Keelan/www.keelanmusic.com 2008. Please write for permission to use them on other websites. 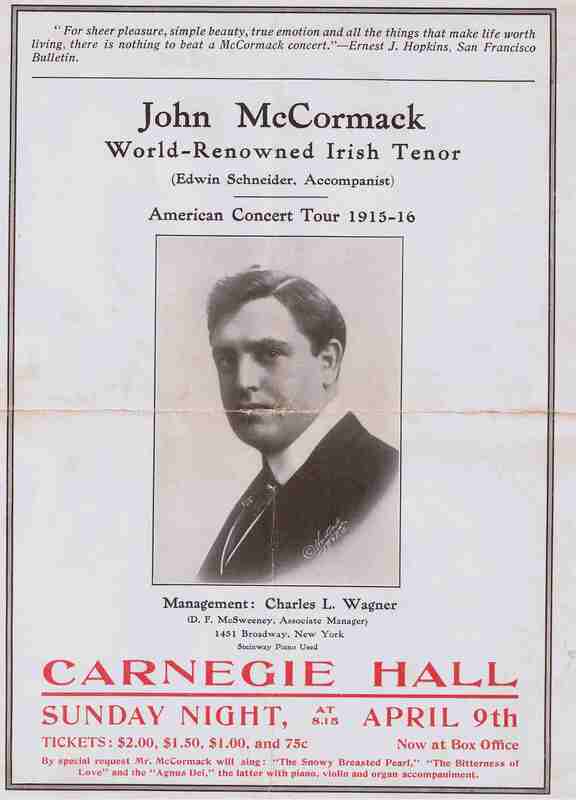 above photo: a 1916 Carnegie Hall pamphlet. 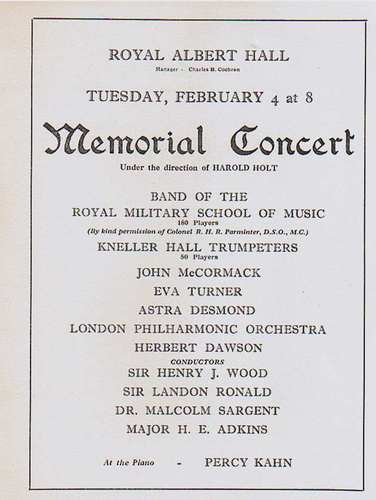 McCormack sold out that hall, the Hippodrome and other major venues many times over in every season in those pre-WW I years, often presenting as many as a dozen concerts in NYC, alone. 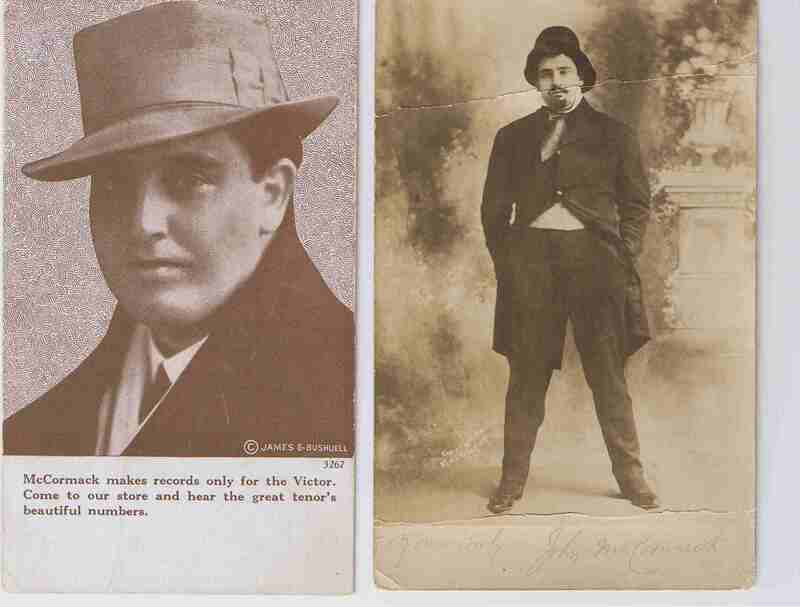 left: young John looking jaunty in a pork pie hat for a 1912 Victor ad. As noted elsewhere, he and the Victor Company had a mutually beneficial financial relationship. His recordings sold in the high thousands of copies, especially his Irish song and Victorian ballads records. right: John McCormack, the International Opera Star, NYC, 1910; his first season at the Metropolitan Opera House, as Rodolfo from Puccini's La Boheme. In many opera houses he also sang Lt. Pinkerton in Madama Butterfly for many seasons, and he had a special liking for another Puccini role, the dramatic role of Cavaradossi in the grand opera Tosca. Outside of the "modern" composer Puccini McCormack was especially noted as Don Ottavio in Mozart/da Ponte's Don Giovanni; Edgardo in Donizetti's Lucia di Lammermoor; Tonio in Donizetti's The Daughter of the Regiment; Elvino in Bellini's La Sonnambula; Almaviva in Rossini's The Barber of Seville; the French romantic tenor roles of Faust and Romeo, by Gounod, and Gerald, from Delibes' Lakme, and two Verdi roles: Alfredo in La Traviata and Il Duca in Rigoletto. He also sang very infrequently the tenor leads in Mozart's The Magic Flute; Flotow's Martha; Offenbach's The Tales of Hoffman; Herbert's Natoma and Mussorgsky's The Fair at Sorochintzke. Although not a large voice, it carried well in most opera houses because of the superb technique that was intuitive as well as placed by the Italian vocal maestro Sabbatini. That ability, wedded with a natural legato, exquisite musicianship and sweet-timbered Celtic vocal charm made McCormack especially valuable at that time, and a striking alternative to the Italian and Spanish tenors who ruled the Italian opera "wings" of major opera houses. His voice was nearly ideal (read below) for the early 19th-century bel canto repertoire in the first years of his opera career, from 1907-1914, notably at the Royal Opera at Covent Garden, London. 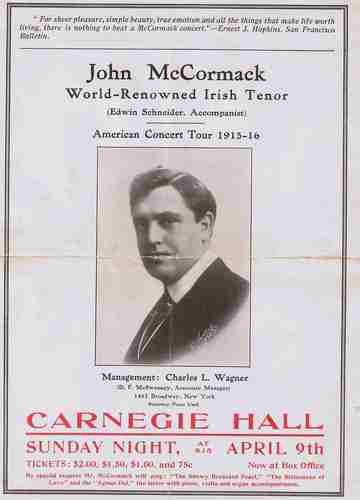 McCormack also sang in the prestigious opera houses of Chicago, Boston and Philadelphia after making his American debut in 1909 for Oscar Hammerstein's Manhattan Opera House. When that house closed he joined the Metropolitan Opera, on/off from 1910-1918, primarily as a guest artist. McCormack finished his opera career in 1921 and 1923 in Monte Carlo, a lovely ornate theater perfectly suited to his vocal strengths. That last season he sang Rossini, Puccini, Mozart and Mussorgsky. He sang a limited schedule in 1922 (no opera) due to a severe strep throat illness which nearly killed him, in those pre-antibiotic days. It has long been a subject of discussion among McCormack scholars how that illness affected his voice. Many detect a marked difference on recordings after that illness, but I don't hear it that much, and he had finished recording the "mainstream" arias that demanded B-flat and above by 1917, and the bulk of those were done from 1908-1916, when he was in his twenties. The few Handel and Beethoven arias he recorded between 1920-36 didn't place high range demands on the voice. He never had an especially "long" voice to begin with, and he was nearing 40 years of age in the early 1920s and the voice was changing somewhat. To quote Henry Pleasants in his The Great Singers book, "the top notes, above B-flat, were not his by divine right, and he did not have them for long." Indeed, even in his early years I would presume that McCormack had to make adjustments in the Donizetti & Bellini roles with high-lying tessituras as did the mid-20th-century lyric tenors Valletti, di Stefano, Alva, and Monti--only in the last thirty-five years with Luciano Pavarotti, Nicolai Gedda, Enrico di Giuseppe, Chris Merritt, Frank Lopardo, Rockwell Blake and Juan Diego Flores have we begun to hear those bel canto tenor roles sung with most of the original high notes intact and in the correct keys. In other music, McCormack, like Caruso--and later Tucker, Domingo and even Pavarotti (post-1980)--always transposed down by a half-step the aria from Puccini's La Boheme. 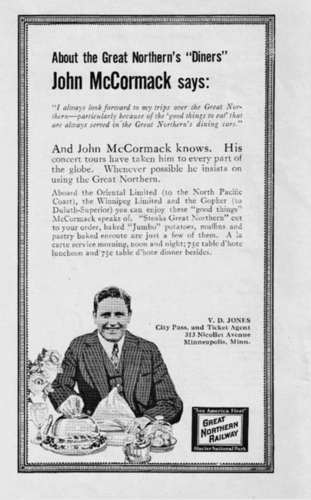 We should also remember McCormack maintained a grueling concert schedule up until the early 1930s--the voice could be expected lose some of its youthful ease and vigor. After 1923 he devoted himself to the concert stage, recording studio, radio and films to reach his immense public. above: Ad for a railroad, circa 1920. From a somewhat more-leisurely era. Like present day celebrities, McCormack was approached to do lucrative endorsement ads--though not for millions of dollars, like today's stars receive. I have previously mentioned his grueling concert schedule, and in his long career he spent thousands of hours aboard trains and ships while traveling on tour and no doubt ate as many meals! left: in 1936 John McCormack made a guest appearance as himself in the first technicolor film from Great Britain. 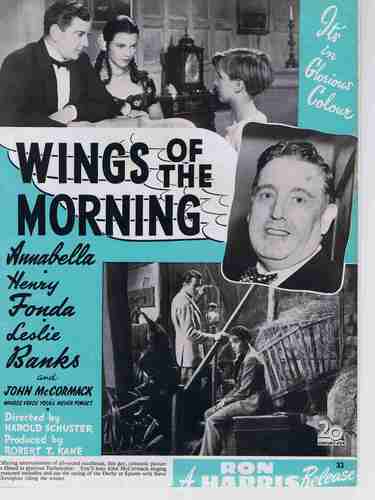 It starred young Henry Fonda and Annabella who later married Tyrone Power. McCormack sang "Endearing Young Charms," "Killarney" and "The Dawning of the Day." It is another rare "performance" document of the great tenor in late career, and it looks as if he is actually singing "live," no "lip-synching" as was then being done. Personally, I find the film to be a bit dull, and McCormack's brief appearance is the highlight of it. 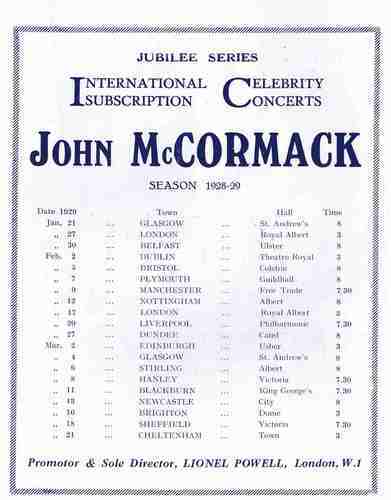 It was always an occasion where ever McCormack sang, and he performed several times in Lincoln. This event was held at historic St. Paul Methodist Church, shortly after WW I ended, This landmark community church is still in service and as active as ever, including as a concert venue. My wife Kelly and I often attend services at St. Paul UMC and I sang there in the late 1960's in the choir as a scholarship student. We have presented several of our annual holiday concerts there in recent years and it is fascinating to know that McCormack's voice once reverberated in the massive sanctuary. Note the coming attractions and the justified hyperbole used in describing them! 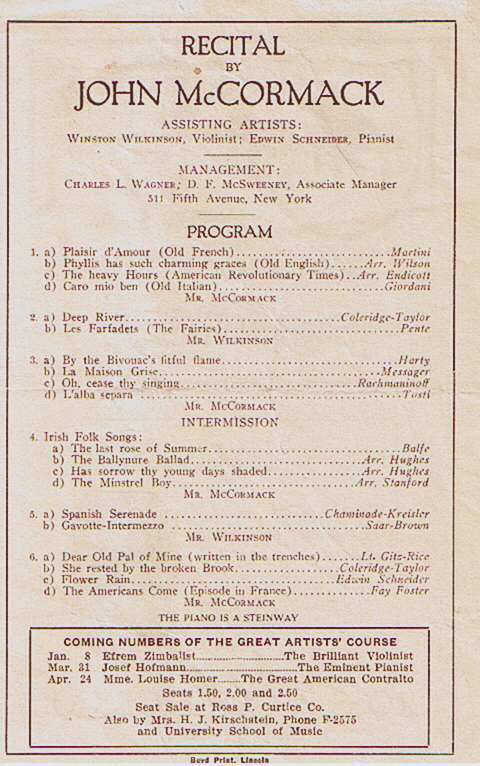 Nathan Milstein, Lawrence Tibbett, James Melton and others also performed there pre-1950. 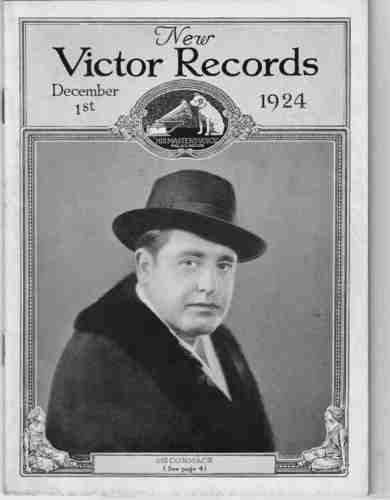 McCormack sold millions of records for the Odeon, Victor and HMV companies over the decades, and this small booklet was sent to dealers to advertise the latest Victor 78 records. It is the end of the 30-year acoustic recording era and mid-point in McCormack's nearly 40-year career. 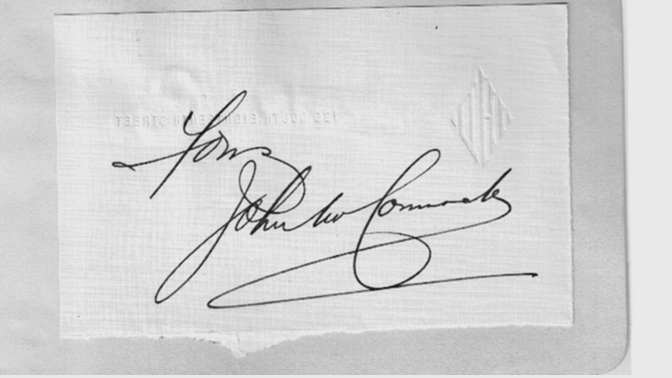 He would record his first electrical records in April, 1925.
a John McCormack signature--more flambouyant than usual! John McCormack signatures on photos/letters/programs/album pages/stationary are highly desirable. I purchased this one with an unsigned Hartsook photo portrait of the young tenor circa 1912 (which IS signed by the famed NYC photographer). 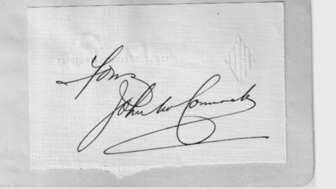 I am guessing this signature, taken from a page of stationary, dates from about then, early in his USA career. It is more expansive than his later signature. signed by Frank Patterson, "Ireland's Golden Tenor"; Count Cyril McCormack, his son; John McCormack, his grandson; Robert White, celebrated USA concert tenor. He and Patterson were both considered to be the legitimate heirs to McCormack's Irish Tenor Throne in the 1970s/80s/90s. The last signature is that of Liam Breen, world-famous McCormack collector. Sadly, three of these gentlemen are now gone. 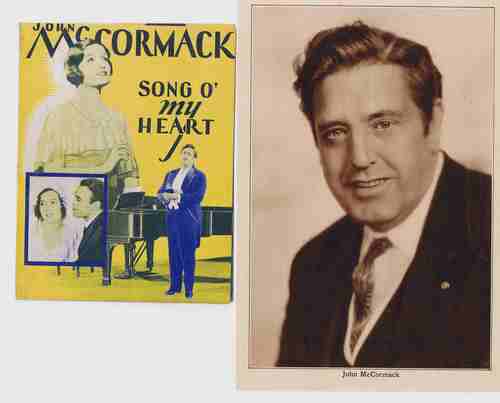 John McCormack was paid $500,000 to make the film Song O' My Heart in 1929/1930, shot in both Ireland and California, USA. It is a typical sentimental story of the time which showcased the great singer in fourteen selections, which delighted his many fans. It co-starred a young Maureen O'Sullivan as well as Alice Brady and John Garrick. There were two versions--a silent version, except for the music; and a full-talkie. It is our most-valuable document of McCormack "in person" and "in concert." This is a small "herald" for the film which opens up and a Hollywood portrait of him from 1930. 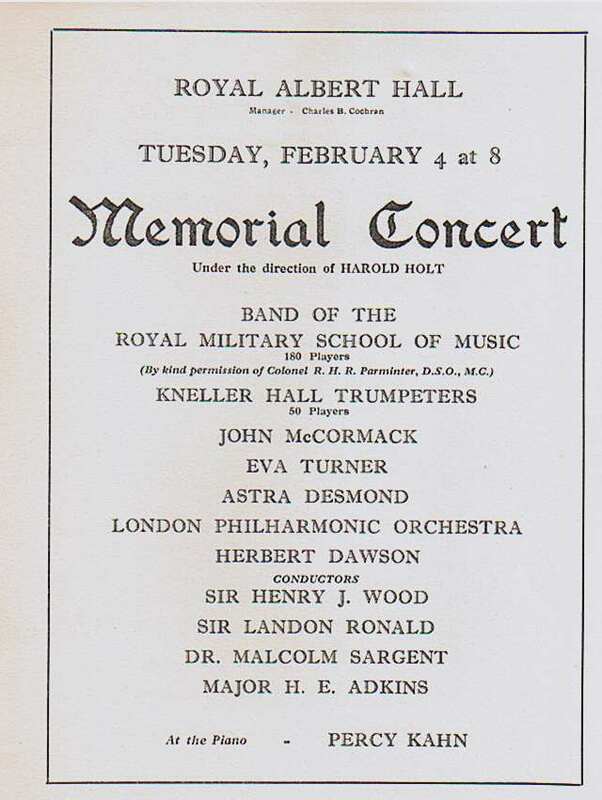 King George V passed on in January, 1936, and this gala event was presented in early February. As you can see, it featured many great artists of that time active in the British Isles. In the first half McCormack sang the Handel airs "Caro Amor" and "Vi sento si vi sento"; in the second half he sang the Irish melody "It is not the tear at this moment shed" and Handel's "Where 'ere You Walk." 1936 was a busy year for the tenor, nearing the end of his long career. That summer he would appear in a film as himself and in April he recorded two of the airs he sang at this concert: Handel's "Where 'ere You Walk" and "Caro Amor." The former is considered to be one of his greatest recordings. You notice who got top billing among the soloists! 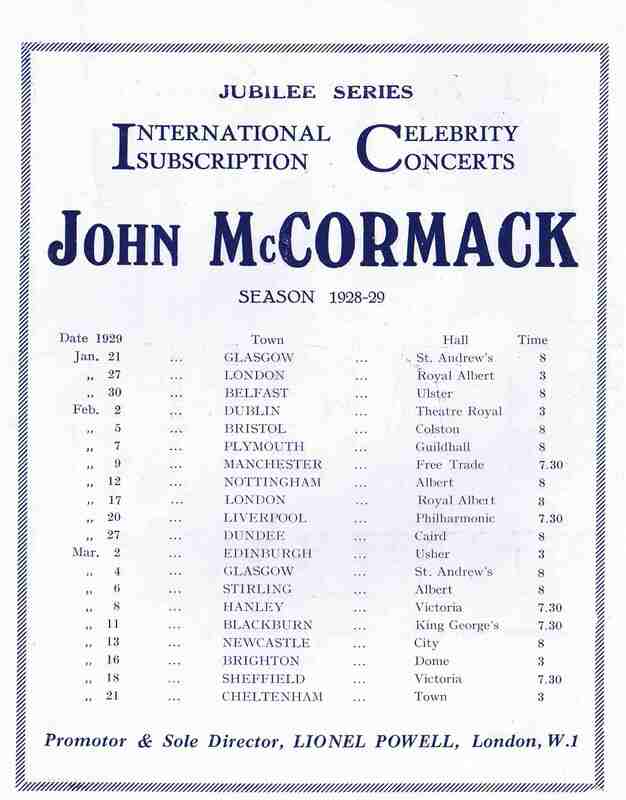 This is a schedule of John McCormack's busy winter tour of 1929 of the British isles, under the management of Lionel Powell. He was 44 years old. It covers a two month period of mid-January to mid-March and he sings twenty recitals--one every three days. Few major singers today would sing this much in that period of time. This was the era of rail and steamship travel--no passenger airflights, yet. And this is a lighter schedule, in the second half of his career. There are two dates at the Royal Albert Hall in London along with concerts in other large cities as well as much-smaller communities. Later, that summer, he would commence filming Song O' My Heart in Ireland. 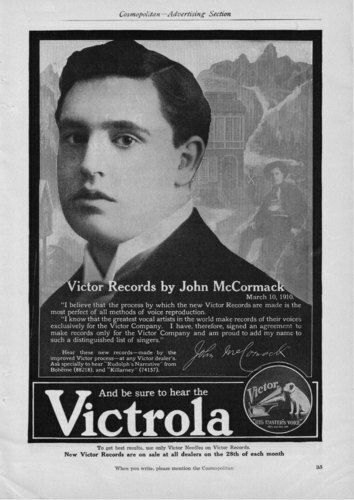 John McCormack considered this to be the most important event of his career. In 1932 the Papal Legate and his party traveled to Dublin for the 31st Eucharistic Congress, which lasted a week. On the last day John "Count" McCormack of the Roman Catholic Church as a Papal Chamberlain served as a canopy bearer for the Holy Eucharist in the march to Phoenix Park where the final Great Mass was held. There he was soloist in Franck's "Panis angelicus" with a choir of 500 behind him. It was broadcast all over Ireland and the British Isles via radio. 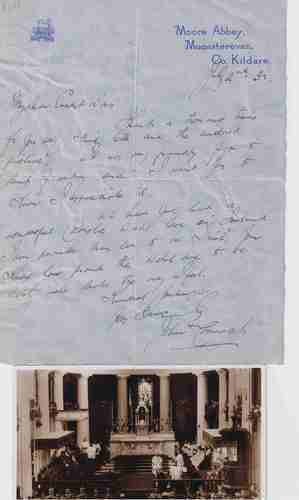 This is a letter written from his mansion Moore Abbey the week after the Council to a Mr. Ernest Davis, who apparently sent him some photos. In it he states "I am prouder than ever to be Irish--you know how proud the Welsh are, well that's the way I feel." Below is a postcard of a Mass held earlier in the week. Keen eyes and a magnifying glass will spot the tenor off to the right. Beginning with a New Year's Eve 1925 broadcast McCormack was an early pioneer in radio broadcasting and he was very comfortable in the medium. He broadcast on both sides of the Atlantic up until 1942, past his official retirement. On radio he appeared on his own programs as well as a guest on programs starring Bing Crosby and Rudy Vallee. It brought his voice to millions; not just hundreds or thousands as in the past with recitals and records. This attractive cover from the early 1930s was just one of many that featured his image and sold thousands of copies nationwide. Edwin Schneider arranged this Thomas Moore song. "Teddy" was his faithful accompanist and friend for a quarter century, from 1912-1937, until McCormack's American retirement.